Chester Arthur was the 21st President of the United States who served in office from September 19, 1881 to March 4, 1885. What was the life of Chester Arthur like? The short biography of President Chester Arthur covers important information and facts about his early life, his family, career and the famous events and achievements of his political life. Our short biography of Chester Arthur provides an interesting and easy way to learn about the life of the President. The following important facts provide a fast overview of important facts about President Chester Arthur. Facts and Info: Chester A. Arthur was the 21st president of America well known for being honest and responsible. His important accomplishment was the reform of the civil service system. For additional info refer to 20 Facts about Chester Arthur. Facts and Info: Chester Alan Arthur was born on October 5, 1829 in Fairfield, Vermont, the son of an abolitionist preacher. His father was an Irish immigrant and his mother came from Canada. He was named after Chester Abell, the doctor who assisted in his birth. From relatively humble beginning he rose to the highest office in the land. He died on November 18, 1886 in New York. Facts and Info: The career of Chester Arthur included the roles of Teacher, Lawyer, Politician and Statesman. He was educated and graduated from Union College. He became the 21st President of America in 1881 and served for 4 years until 1885. His nickname was "The Gentleman Boss" because of his dapper clothing. He was fastidious dresser with an extensive wardrobe and would often change his clothes several times a day. Facts and Info: Chester Arthur married Ellen Lewis Herndon Arthur on October 25, 1859. They had 2 sons and a daughter. His wife, Ellen Herndon, died before he took office. The president's sister, Mary Arthur McElroy, served as the unofficial First Lady and also looked after his children. Facts and Info: Chester A. Arthur belonged to the Republican Political Party. He was 50 years old when he was inaugurated as the 21st president. Inauguration is a President's swearing-in ceremony. Chester Arthur was never elected to the presidency but succeeded to office after the assassination of James Garfield. For additional facts refer to his Presidential Cabinet members. Short Biography of Chester Arthur: What he was like! Facts and Info: Chester Arthur was an imposing figure standing at 6 feet 2 inches tall and weighing approximately 225 lbs. He had wavy brown hair, black eyes and had side-whiskers and a moustache. He hired the most famous designer in New York, Louis Comfort Tiffany, to transform the White House into a showplace befitting the office of the American President. Facts and Info: During his lifetime he played a key role in important events of the era. Chester Arthur was a reformer and worked hard for the reunification of the nation after the Civil War and Reconstruction. He supported the Chinese Exclusion Act of 1882 and the Pendleton Act for Civil Service reform. 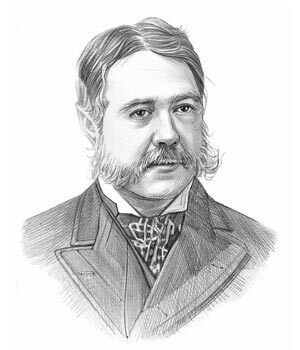 Facts and Info: Chester Arthur died of apoplexy, a cerebral hemorrhage and stroke, on November 18, 1886 in New York. He was 56 years old. Chester A. Arthur was buried in Albany, New York. The short biography of Chester Arthur provides a fast overview of the key facts and events about his life and the accomplishments of his presidential term in office. The following Chester Arthur video enables you to sit back and listen to the history of his personal and political life - a useful educational resource for kids, children and schools learning about the life of President Chester Arthur.